We have many selections in fog output power. Many fogger accessories. 30 day money back guarantted! A great suppliment to waterfalls, water foundtain, pond or landscaping application. See general instruction for detail application information. Prices include shipping and handling fees for address within the mainland U.S. Order will be shipped on the same day or next business day. 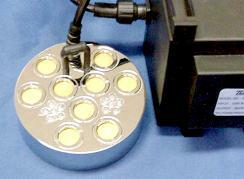 Quality ultrasonic fogger with 230V/24V UL listed adaptor, white disc, fogger head size 38mm(diameter) x 45mm(h). CE. RoHS. listed. Quality ultrasonic fogger with white disc, 120V/24V UL listed adaptor, fogger head size 1.5"(W) x 2.5"(L) x 1.25"(Height), great application in shallow water container, water level is required just above 1.25" in height. CE. RoHS. listed. Quality ultrasonic fogger with 10W optical film lens underwater light sharing one transformer, fogger size: 1.5"(dia) x 1.75"(H), light size: 1.5"(dia) x 1"(H). 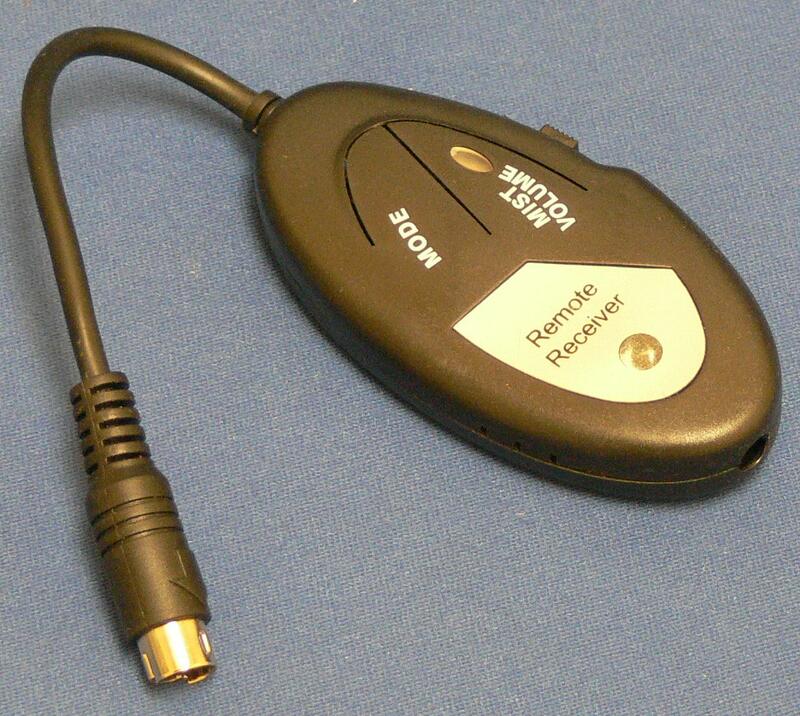 Item: MTL01; Input:110V UL. CUL. listed. Item: ML021LRC; High output mist maker with wireless remote controller and inline controller/receiver which allow you to control mist output and change LED light color to what you want in distance over 30', you can select a single color, multi color or auto changing color lights, higher output than regular single mist maker. Fogger head size 1 7/8" dia. 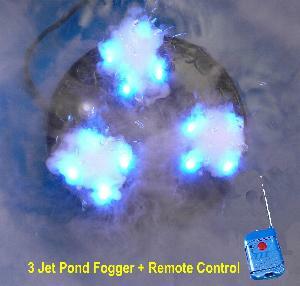 x 2" h.
Table top fountain fogger comes with LED color changing lights(between red, blue, green and mixed color). 12W, 110V-240V/24V AC, 0.5A, UL listed transformer works in the USA(110V) or European country(240V). Fogger head size 2" dia. 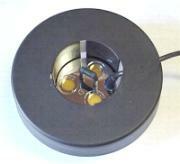 x 1 1/4" h. It fits most of table top mist lamps or aloma oil mist fountains. On sale: $19.95/each, shipping included in the USA. 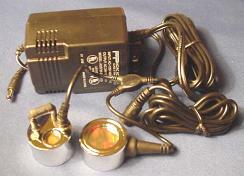 Mist maker with LED color changing lights(between red, blue, yellow and mixed color), 6' cord with outdoor/indoor connector. 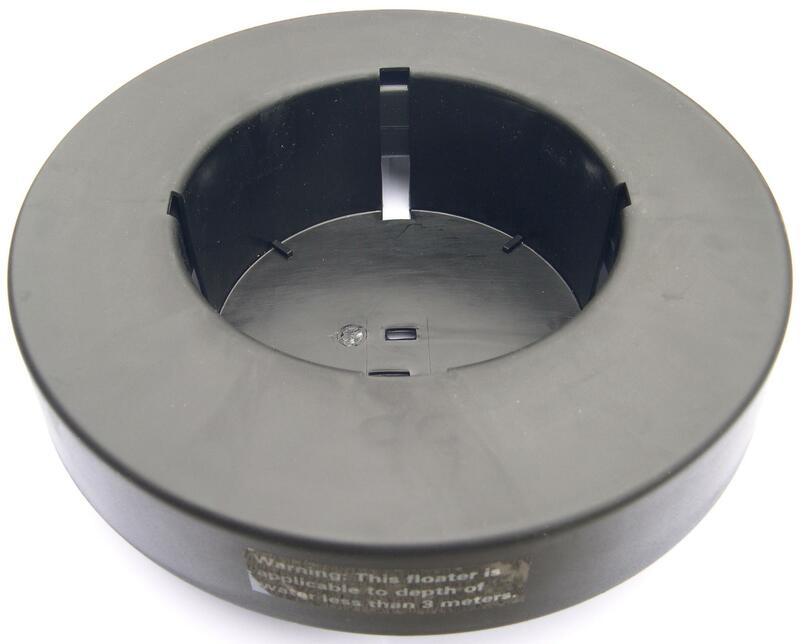 UL listed rainproof transformer. Fogger head size 1 3/4" dia. 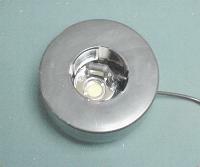 x 1 3/4" h. It fits most of mist lamps or mist fountains. shipping included in the USA. 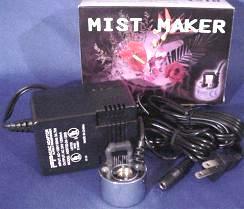 Mist maker with LED color changing lights(between red, blue, green and mixed color). UL listed transformer. 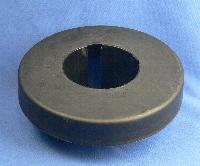 Fogger head size 1 3/4" dia. 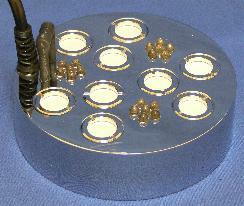 x 1 3/4" h. It fits most of mist lamps or mist fountains. 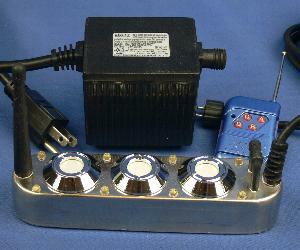 Comes with UL listed 13V 800mA transformer. 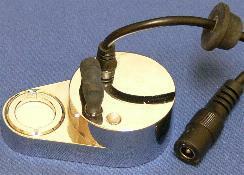 Fogger head housing size 1 3/4" dia. 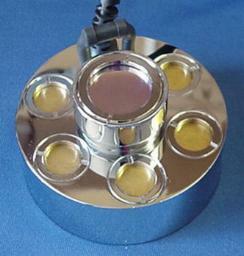 x 7/8" h. Water low sensor 1" high. Cord length 6'. Water consumption 70ml/h. 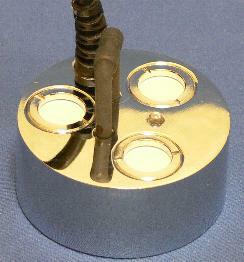 This mist maker is made of metal housing with 3 mounting ears. Price: $29.99/each, shipping included in the USA. High output 5 mister VDC fogger with 48VDC input transformer, including a K004 buoy, 32' long cord from transformer to fogger. 5 disc mist maker, great for indoor, outdoor fountain, waterfalls, pond, green house or industrial use, also a great negative ion generator and humidifier. Heavy duty transformer, 32' long cable. 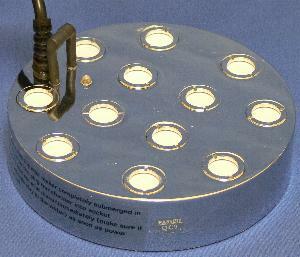 Fogger size: 3 3/8"diameter x 2 3/8"(h). 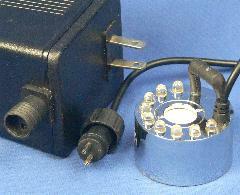 5 disc mister fogger, indoor/outdoor transformer 120V/24VAC, 32' long cord from transformer to fogger. 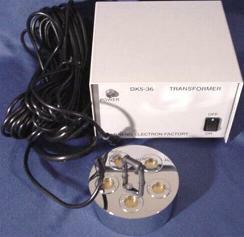 High output 5 mister fogger with indoor/outdoor transformer. High output 5 jet mist maker with built in LED color changing light, white discs, fogger size 4"(dia) x 3"(h), cord length 32', light color rotates between red, blue and yellow. Great for pond, waterfalls and large fountain. 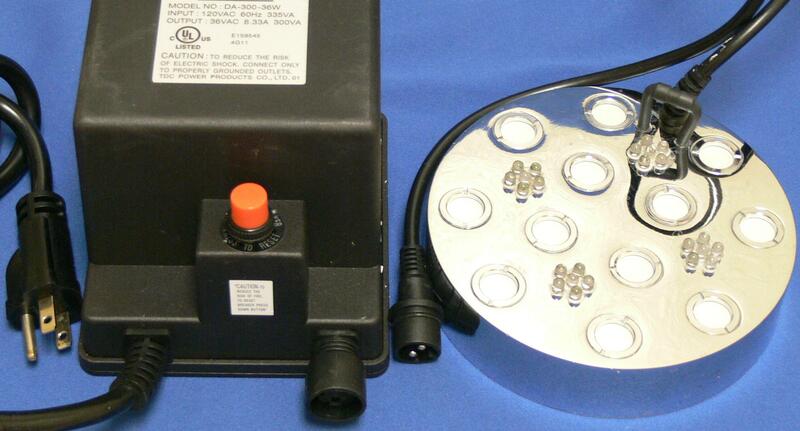 Shipping included in the U.S.
High output 5 mister fogger with 15W built in underwater light, outdoor/indoor transformer, 32' long cord between transformer and fogger, fogger head size 3.25"(dia) x 2.25"(h), comes with 4 color lenses(red, yellow, blue, clear) and key LC3. You can unplug the light bulb and just run the fogger if needed. 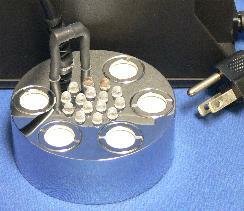 High output 6 jet mist maker named “Mist UFO” incorporating 36pcs. 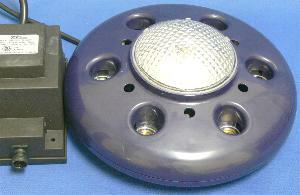 LED with light color automatically changing function and built-in buoy. 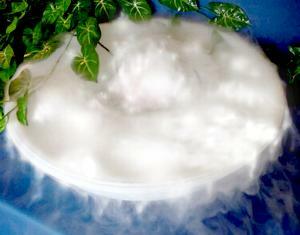 Adopting ultrasonic technology to Create mystical fog as dry ice effect but without dry ice and chemicals. 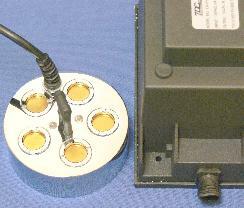 Unit comes with a UL listed transformer. Great for pond or waterfalls. 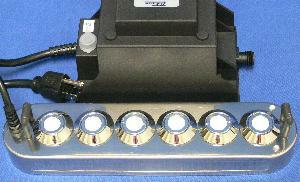 High output 3 jet mist maker named “Mist UFO” incorporating 36pcs. 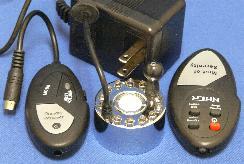 LED with fog/light remote controller and built-in buoy, 33' cord. You can remotely control your fogger on/off, control the light for single color, multi color, automatically changing color, flashing color... Unit comes with a UL listed transformer. Great for pond or waterfalls. High output 3 jet mist maker with single color LED light(8 LED bulbs), a remote controller to control on/off and two stage mist outputs, 33' cord. controller has 4 buttons, "A" turn off unit; "B" high mist and light on; "C" less mist and light on; "D" mist off and light on. 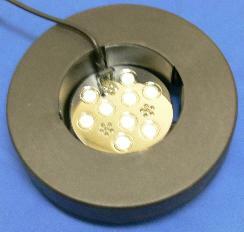 LED light is single color and always on when power is on. Unit comes with a UL listed transformer. good for shallow water pond, fountain, or waterfalls with rocks around. High output 9 jet mist maker with built in LED lights, outdoor/indoor transformer, fogger size 4.75"(dia) x 2 1/4"(h), cord length 32', great for pond or waterfalls, comes with a specially designed auto buoy. High output 9 jet mist maker with built in LED lights, white discs, 230V/36VAC outdoor/indoor transformer for Europ, fogger size 4.75"(dia) x 2 1/4"(h), cord length 32', comes with a specially designed auto buoy. Sales Price: $159.00/each; 2 or more $155.00/each; Plus shipping. High output 6 jet Ocean Mist Maker with built in 32 LED lights(8 red, 8 blue, 8 green, 8 yellow), indoor/outdoor transformer, 33' long cord between transformer and fogger. Fogger size 10"(L) x 2.5"(W) x 2"(H). Price: $119.50 each; shipping included in the U.S.
add $7.5 for a buoy SPK04E, check box. High output 6 jet Ocean Mist Maker with indoor/outdoor transformer, 33' long cord between transformer and fogger. Price: $115.95 each; shipping included in the U.S. Description: Buoy for fogger DK6-24C or DK6-24(fogger not included), it holds fogger at its optimum working position in water. Price: $15.95 each; shipping included in the U.S.
Super high output 12 jet mist maker with built in LED lights, outdoor/indoor transformer, fogger size 6"(dia) x 2 1/2"(h), cord length 32', great for pond or waterfalls. Super high output 12 jet mist maker without decorative light, outdoor/indoor transformer, fogger size 6"(dia) x 2 1/2"(h), cord length 32', great for pond or waterfalls. Super high output 12 jet mist maker with European input voltage, outdoor/indoor transformer, fogger size 6"(dia) x 2 1/2"(h), cord length 32', great for pond or waterfalls. Disk size: 20mm white disc. This is also the replacement mist maker for MHS and MHB12 series industrial humidifiers and commercial humidifiers. 5 replacement white disks with key set, good for all using 20mm disc foggers including high output fogger M003, MCL03, M005, M005A, MCL05, ML05, ML09, ML09A, M10, DK6, DK12, not for DH24E. Price: $19.00/set; Shipping included in the U.S.
$15 each when fogger is ordered, check box. High output 3 mister fogger with white discs, it diffuses 300 ml water per hour, for indoor, outdoor fountain, pond, greenhouse or waterfalls... heavy duty outdoor transformer, 32' long cable. 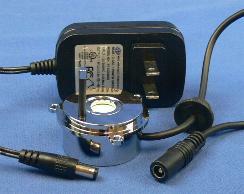 High output 3 mister fogger including a buoy(item K009) and heavy duty outdoor/indoor transformer. High output 3 mister fogger with outdoor transformer. 3 replacement white disks with key set, good for all using 20mm disc foggers including high output fogger M003, MCL03, M005, M005A, MCL05, ML05, ML09, ML09A, M10, DK6, DK12, not for DH24E. 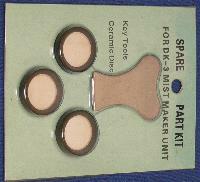 Price: $14.00/set; Shipping included in the U.S.
$9 each when fogger is ordered, check box. Sit fogger 2 to 3 inches below the surface of regular clean tap water, with ultrasonic sound, the surface of the water is turned into a mist. 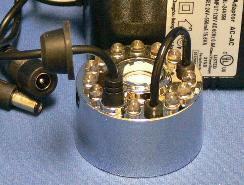 Fogger head's height is the minimum height of container water level required for fogger to work. Fogger head must be fully under water when power is on. The mist can flow out of the container and re-accumulate on the surface of the floor or table near by. These dramaticaly increase the need to add water to the container to keep fogger running normally. 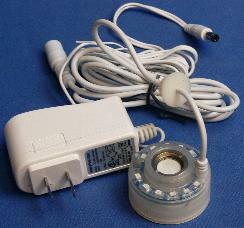 When water level is low, sensing probe shuts off unit automatically, unplug the power or add more water if so. Quality white replacement mist disk with key, good for all using 20mm disc foggers including M001, M001A, MQ01, MBL01, ML021LRC or ML021, not for DH24E. $3 each when fogger is ordered, check box. 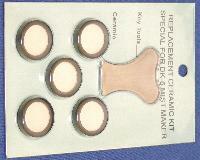 Replacement white disk with key, good for any using 16mm disc foggers including DH24E, MTL01, MDC01. 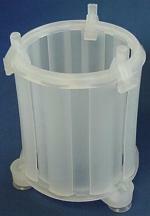 Fogger water splash guard for single fogger M001, M001A, MTL01, MDC01, ML021, MBL01, FQ20 or MD2. $3.95 each when fogger is ordered, check box. Mist governor with 3 interstage adjustment which controls the amount of fog for fogger M001, M001A, MQ01, MBL01, MCL011, MCL012, not for MDC01. 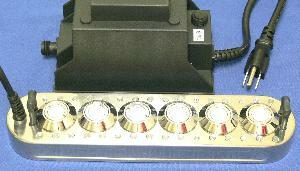 Also it is a dimmer switch for aqua light. Description: Fogger buoy for M005(M005A), it holds fogger at its optimum working position in water. Description: Fogger buoy for M003(M003A), ML03, MCL011(fogger not included), it holds fogger at its optimum working position in water. Description: Fogger buoy for M001(M001A), MBL01, CH24 and MDC01(not fit ML021 or ML021LRC)(fogger not included), it holds fogger at its optimum working position in water. $5.00 each when fogger is ordered, check box. Description: Fogger buoy for M009, ML09, MCL09, DK9-36, DK9-36C(fogger not included), it holds fogger at its optimum working position in water. Description: Fogger buoy for DK12 and DK12C, it holds fogger at its optimum working position in water. 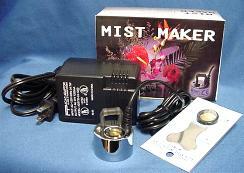 Mist Fogger fountain sales! Up to 20% off on our Mist Fogger Fountains! Please click the Smoking water fountain logo below for more.